Howto to check your OSX Airport Connection Speed. 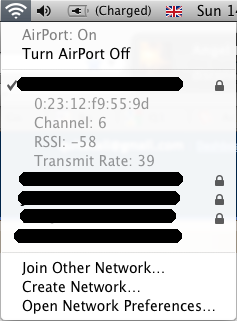 If you've gone out and upgraded your wireless base station to 802.11n capability, like I did when I bought an 'n' capable Airport Express, and my Macbook Pro should have 'n' capability, then its nice to check that you're getting what you've paid for. Well there are two ways to get extra information. The first hexadecimal number is the mac address of the base station you're connected to. Transmit rate is the realtime transmit rate. So do a big upload / file move across your network and that should shoot right up. 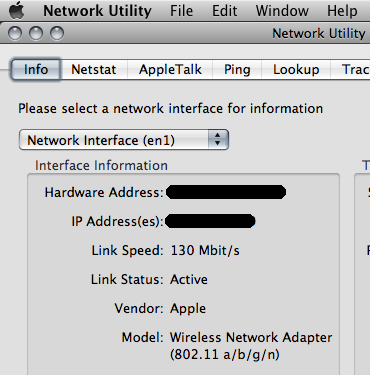 2 - Open the Network Utility application from /applications/utilities, and look under "info", select "network interface en1" (which is usually airport in a real mac). If you have a USB wireless adapter it'll be en2 or maybe en3. Link Speed tells you the story.